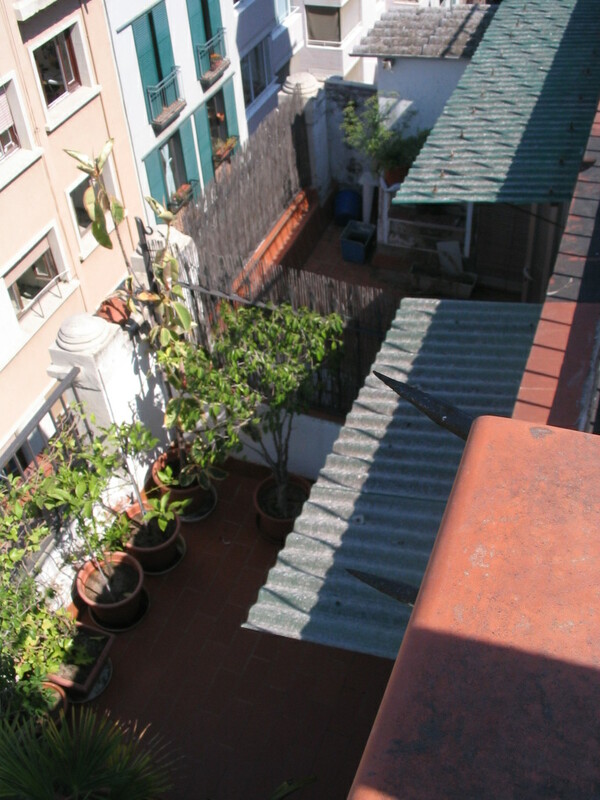 A big perk of our apartment was that it had an allotted roof deck space, a wonderful place to retreat to when feeling claustrophobic (or hot) in the apartment or narrow streets. The views were great. 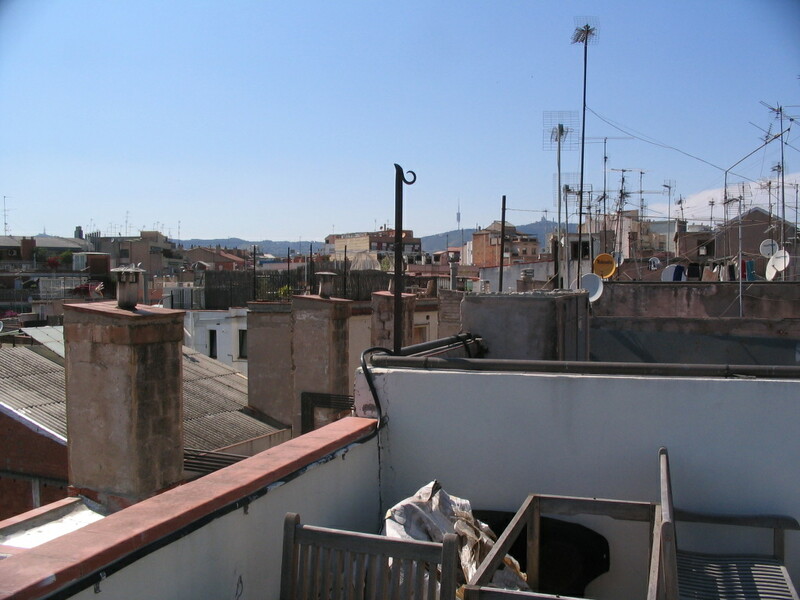 Here, looking south to Montjuïc over the city jumble. 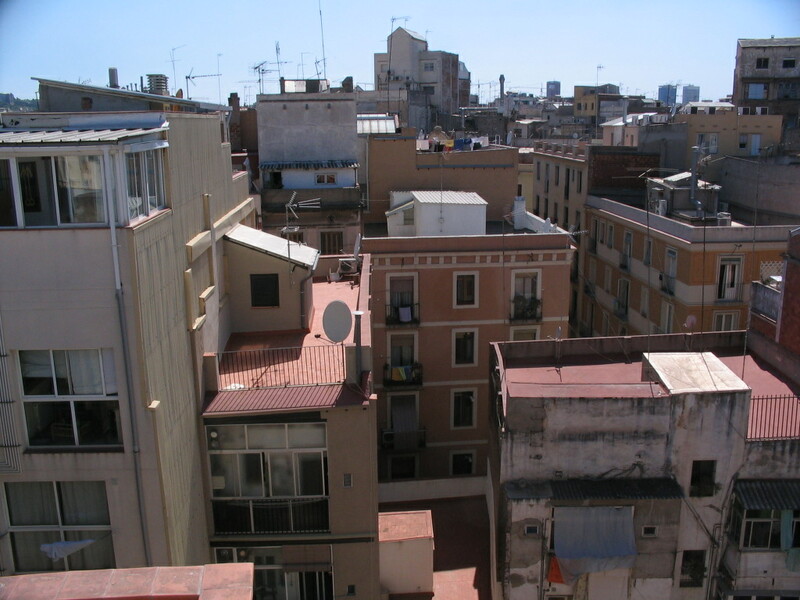 A slightly elevated version of the view out the back of the apartment. 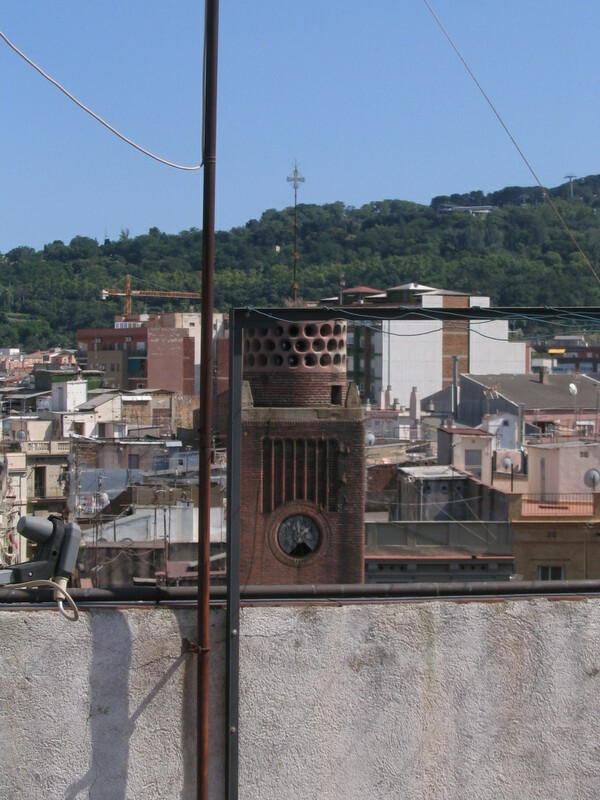 Looking northwest, a glimpse of Tibidabo, the highest mountain of the Collserola range overlooking the city; its church-spiked summit is the furthest-right part of the mountain ridge here. 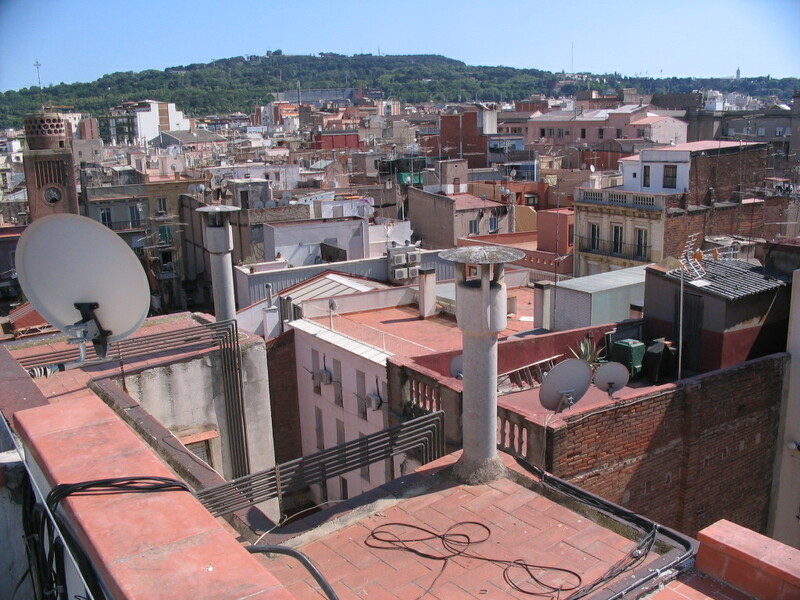 Nearby is the huge TV tower visible to the left of Tibidabo. The top of the stair tower and front lightwell, and the back lightwell visible in front of it. Note that the front lightwell has openings under its roof for ventilation, and the back one has no roof at all! 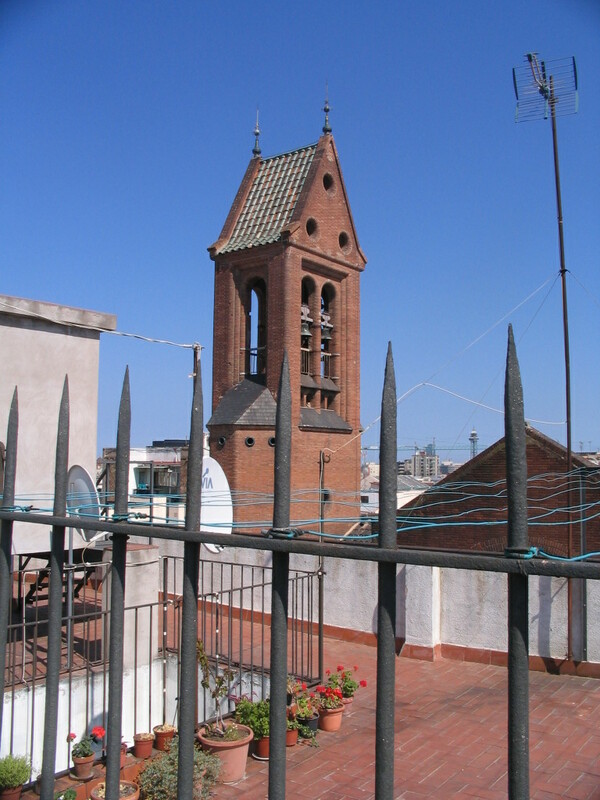 The tower of the Parròquia beyond the similar next building over. 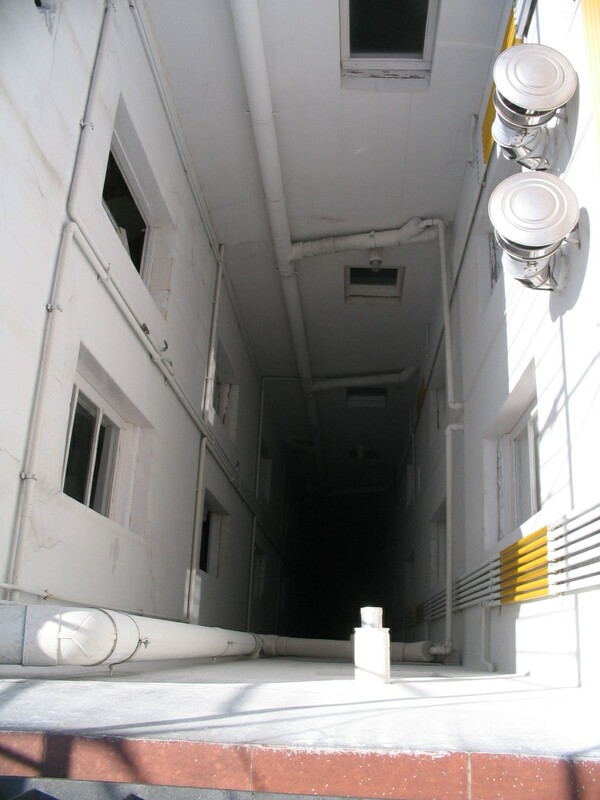 The back lightwell actually has no floor, it's an infinite void. 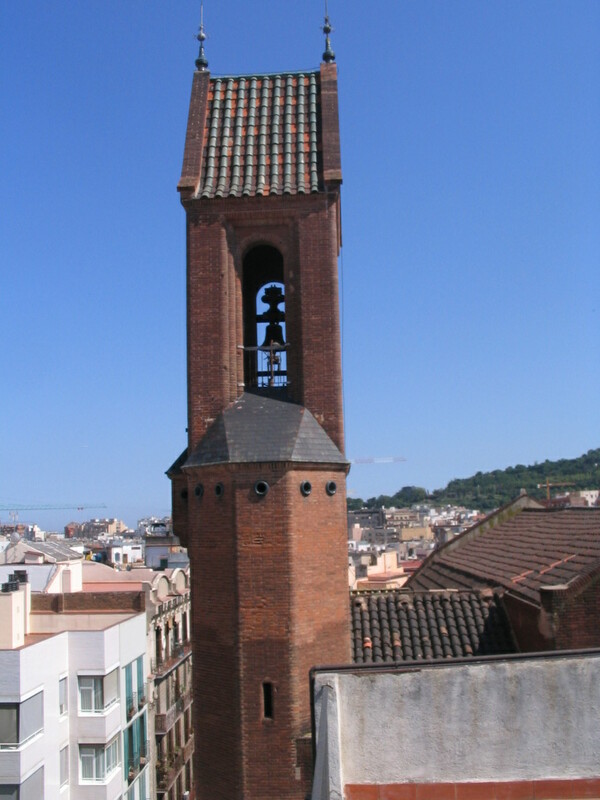 A smaller tower of the church. The rounded-off circular openings are so distinctive. 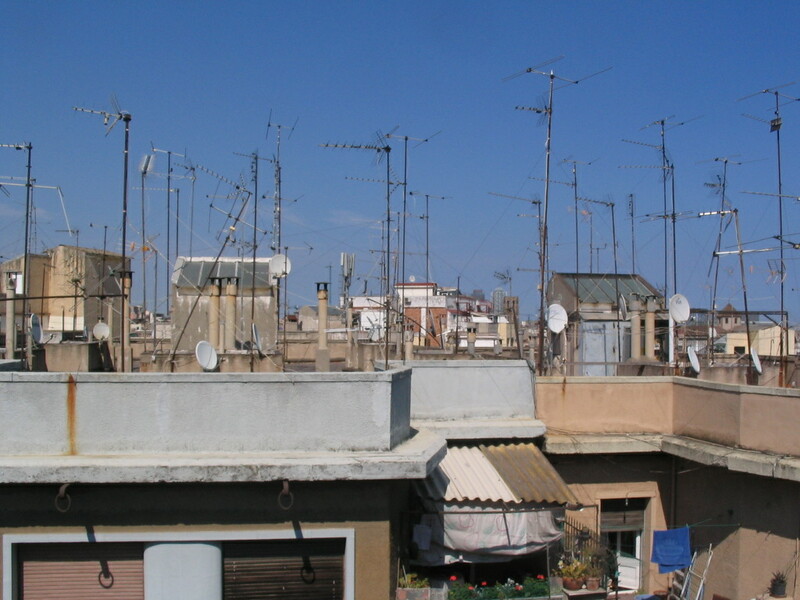 Across Bisbe Laguarda, an infinity of antennas. 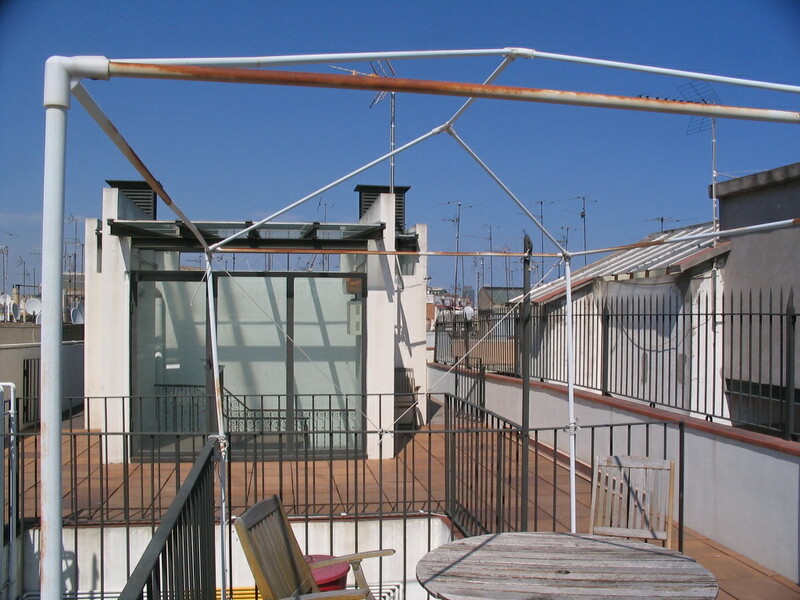 The roof was multi-level; beyond our space toward the street, it was one story lower, with more deck space. Straight through the tower. This brickwork is now reminding me of architecture we would see later on in Amsterdam. 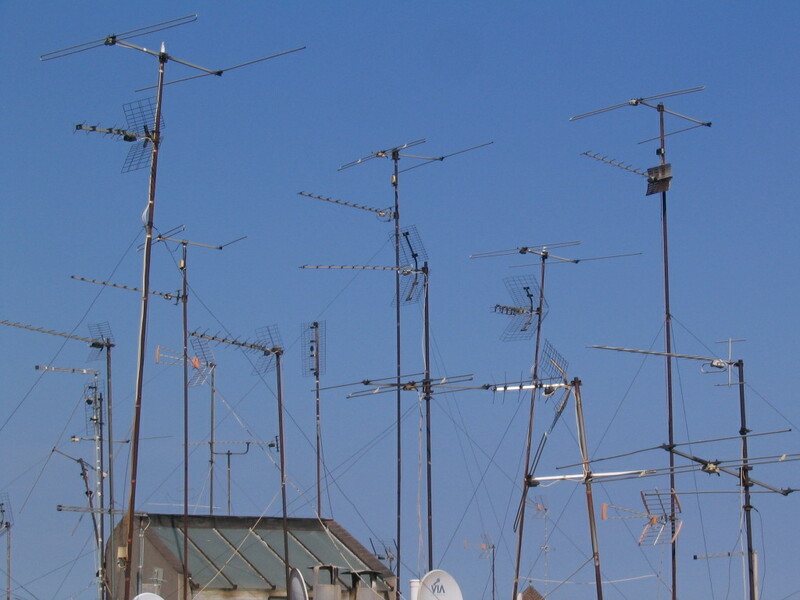 A flock of antennas all pointing at the Collserola TV tower. 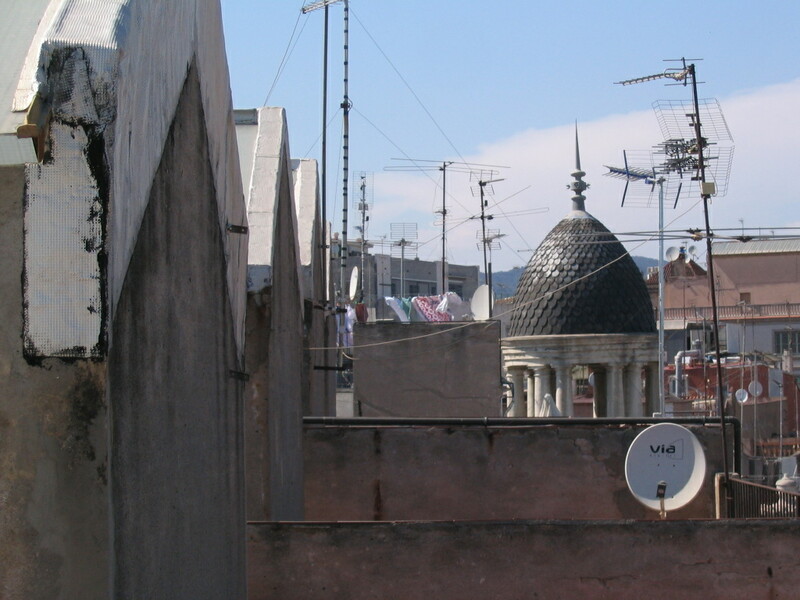 A zoom upstreet, the stair towers of the adjacent buildings to the left and the distinctive dome at the corner visible just beyond. 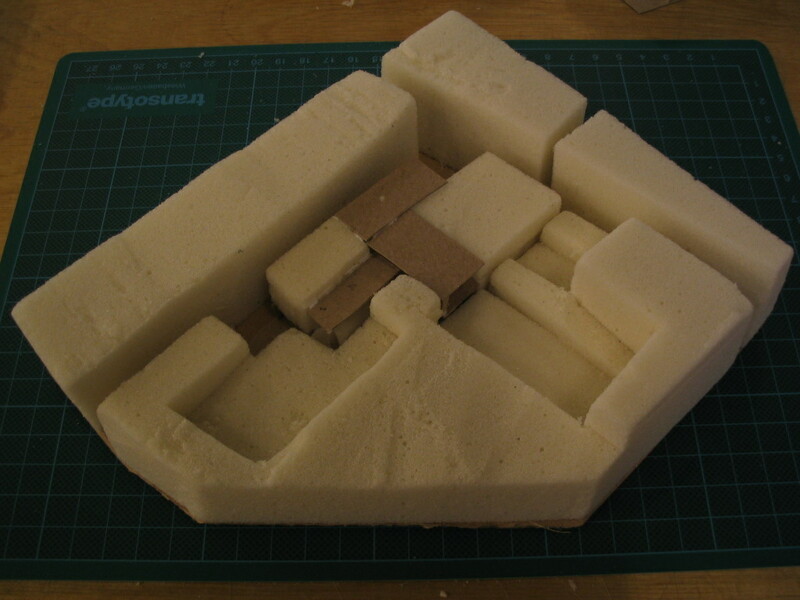 In studio, a very early sketch model within the Plaça Sabartés and its surroundings.